In this Hotel Hell episode, Gordon Ramsay visits Landoll's Mohican Castle, Loudonville, Ohio, owned by mother and son Marta and Jimmy. They sold their printing company to build the castle, at a cost of $6million. Their restaurant burnt to the ground but the insurance had lapsed and the stress led to the divorce between Marta and Jim, Jim retired and Marta still runs the business. Gordon arrives and is awestruck by the castle but brands the gift shop as junk. There is dust on the wine fridge and the ancient television in reception. The castle holds weddings organised by Melody, who hasn't been trained in events. Gordon admires the view but finds mounds of dead flies and cigarettes in a tower. Gordon meets Marta and finds out that the hotel is now only worth $2million. Gordon reveals he has invited a bride and groom with 100 guests to get married in the hotel in a few days. They meet Melody and ask about the food, they offer a buffet without tastings but Gordon insists on a tasting, the bride notices that the linen doesn't match. Jimmy admits that he has never cooked filet mignon, he would google how to cook it, he is told to prepare a selection of dishes, a chicken dish caked in cheese, under cooked slimy salmon and an overcooked filet mignon. Gordon assures the couple that it will improve and he feels the pressure to not let them down. Gordon comes down for a dinner service, he meets Sous Chef Grant and Marta is in the kitchen to help. They cook meat and fish on the same hot plate, the tickets don't have numbers on and there is confusion as to where the food is to go. Two customers order the same dish but it looks different, food sits on the warmer for 15 minutes and no one gets their food at the same time. Gordon orders a room service breakfast package for the bride and groom, it is terrible and is uncooked and he puts together his own package to show them what they should be offering. Marta has written a letter to her son before sleeping at 5am, she reads her letter to him, outlines her stresses and pressures and reduces him to tears. Gordons team give the function room a huge makeover, the day before the wedding whilst the rest of the team work on last minute prep with the bride and groom. Gordon has arranged for a chef to be their consultant and to help them hire a head chef. The wedding begins but he DJ doesn't know how to pronounce their surname but he asks how they would like to be introduced. The bride is impressed with the presentation of the food but they are clearing plates from tables before everyone is finished. Gordon insists the staff do the work and Marta does nothing but relax. The bride and groom brand their wedding perfect, phenomenal and the guests love the food. Gordon tells Jimmy he needs to step up to allow his mother to step back and he promises to stay on track. Since Gordons visit, they have steadily increased bookings, the kitchen has been reorganised and they have hired a new head chef. Jimmy has stepped up as General Manager and Marta has been able to take a step back. Jimmy has lost 65lb since filming and has been on a 3 day intensive course to improve his management skills. The Yelp reviews and the Trip Advisor reviews are both excellent. They have continued to make renovations to the property and in 2018 are building a new block of hotel rooms. Planning a visit to the hotel? Check out their website for further information. 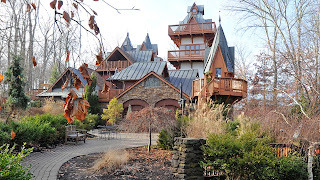 Landoll's Mohican Castle aired on July 26 2016, the episode was filmed in December 2015 and is Hotel Hell season 3 episode 8. Went here last weekend and was disappointed! The room we had was worn and dirty. I have pictures that show the poor condition. Not worth the price. The food was also not good. It would’ve been OK food if it was half the price that they had on the menu. Normal diner food. Not Chef worthy exclusive food! The place is absolutely great.. Please do visit this place.. Good food and a very polite staff.